Fed Up (As Usual) With NBC? Check Out The View From London On The BBC : The Torch There is one gold medal America wins without fail, every four years. It's for the sport of complaining about NBC's tape-delayed coverage of the Olympic Games. Will Americans ever be happy with an Olympics that's not on American soil? 'Morning Edition' executive producer Madhulika Sikka is back in her native Britain on vacation. And in contrast to what she's hearing from her American friends, the viewing choices there for the Olympics are staggering, she says. 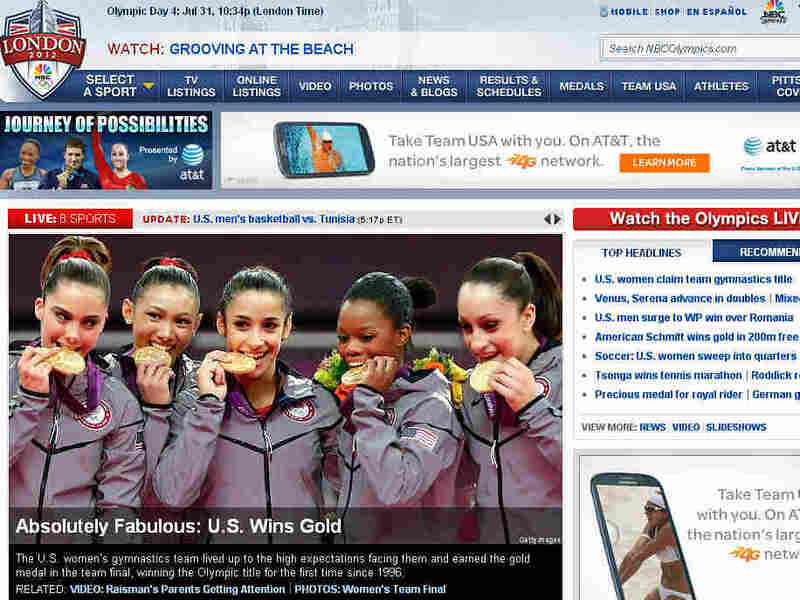 On its website, NBC reported the U.S. women's gymnastics team's gold medal Tuesday. But if you were watching on American TV, you had to wait until prime time to see the competition. The 2012 Summer Olympics are in full swing. And there is one gold medal America wins without fail, every four years. It's for the sport of complaining about NBC's tape-delayed coverage of the Olympic Games. Sports and breaking-news events are the only two things left that people want to watch in real time, we are told. So we when we don't get to watch Michael Phelps race live, that's a problem. It is really easy to complain about coverage of a major sporting event, especially one as big as the Olympics. There is a lot of pressure to get it right, to satisfy the audience and of course, to pay the bills. After all these years of being America's Olympic network, NBC must be used to all the carping. I'm on vacation in London right now, but I have been reading all the complaints. And for the digital-savvy consumers used to watching things on their own terms — who don't live in a world of time zones and tape delays — they have reached a boiling point. In Britain, the venerable BBC is the host broadcaster. After getting a complete roasting about its less-than-perfect coverage of the Queen's Diamond Jubilee celebrations, the pressure has been on to get the London Games absolutely perfect. My goal is not to rub it in to all my friends back in the United States. But as a viewer, I can say that Auntie Beeb has been up to the challenge. As I write, it is early in the games, but my choices are vast. If you get your TV through a cable provider (not bunny ears), the choices seem mind-boggling. The flagship television channel, BBC One, is devoted to Olympic coverage, but there's so much more. Click a red dot in the corner of your screen, and you are directed to a vast menu of what's going on now — and you are informed how much is live. For instance, at 11a.m. on Sunday morning, I was directed to 15 live events that were happening simultaneously; I could have watched any one of them. Watching later, I moved seamlessly from Bulgaria vs. Great Britain in the men's volleyball competition, with commentary, to North Korea vs. France in the women's table tennis, without commentary. I've also dipped into some field hockey and sculls. And then there's tennis: Monday, there were five separate live streams coming from Wimbledon. Not only was I spoiled for choice as to the sports I could watch, but also in the choice within sports. Those are your choices on the telly (as they call it here). There is a breadth of coverage online and on the radio. I watched the hockey on my iPad this morning. I can (of course!) listen on the radio. I've limited my social media diet, just so my Twitter feed will not be overloaded! NBC's Live Extra app was supposed to provide more choice for more people. I can't access it from the U.K., so I can't evaluate it. Maybe the American complaints can only be satisfied when the Olympics happen in the United States, on a time zone that works for us. After all, prime-time advertising is how the bills get paid. In the meantime, I will just thank the BBC for making my Olympic viewing experience about as good as it can be. Welcome to NPR's The Torch. See and hear all of NPR's coverage of the 2018 Winter Olympics in Pyeongchang.